Today is the maiden voyage for the Disney Dream. My favorite Disney podcast creator, Lou Mongello, is at Port Canaveral waiting to board the ship. He just tweeted a picture of the line outside the cruise terminal. 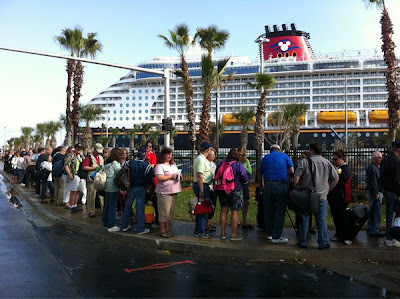 Apparently, guests have been waiting outside since 4:30 a.m. this morning in hopes of getting on the ship extra early. My thoughts are with them this morning since I cannot wait for my turn to sail.